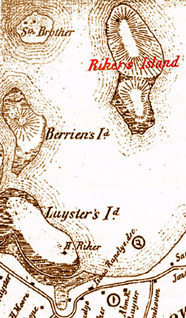 Their Island, Homes, Cemetery and Early Genealogy in Queens County, NY by permission of its author, an 11th generation Abraham Rijcken vanLent descendant, Edgar Alan Nutt. He retains & reserves all copyrights. To supplement the book's few images, NYCHS has added others with appropriate identification. Above left: Image of the book's front cover. Above right: Detail from 1852 map on Page 48 (color added). Below: Excerpts from Preface -- Pages 7 & 8. Ever since its publication in 1852 James Riker’s The Annals of Newtown [D. Fanshaw, Publisher New York. 1852] has been the prime source of early information about the Riker family even though its treatment in the book, other than the genealogy, is only incidental, and even though its Riker genealogy is but one among the many included genealogies. Among the images added to this presentation to supplement those in the book are NYCHS photos taken during a June 5, 2005 tour of the Lent Riker Smith Homestead in Jackson Heights graciously given by its resident-owner/restorer Marion Smith to benefit the Queens Historical Society. 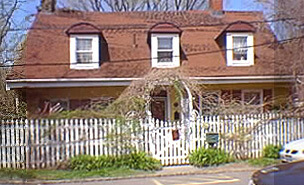 Click the image to visit the Queens Historical Society web site. That genealogy is somewhat frustrating because of its format which makes difficult both the locating of individuals and the ready identification of relationships and interrelationships. This difficulty provided one incentive for the recasting of the genealogy in this present work. The new genealogy is based upon that of James Riker and in essence is limited to it; therefore the reliance upon his work and the debt to him cannot be overstated. Consequently no attempt to bring the genealogy down to the present or to follow every line has been made . . . .
Two additional major sources of information relate to the Riker Cemetery close to the Lent-Rapelye Homestead at Bowery Bay. The first is a survey of the cemetery made in 1919 in which each gravestone is located and numbered, and the second is a listing made in 1932 and edited by Alice H. Meigs [Description of Private and Family Cemeteries in the Borough of Queens, Alice H. Meigs, Editor; pp. 17-23; Queens Borough Public Library, Jamaica, New York; 1932] in which the inscription, or lack of it, on each gravestone is recorded and identified by the 1919 assigned numbers. 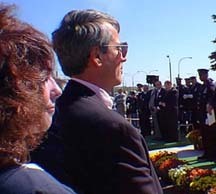 Dorothy Braun and her brother, George, tenth generation grandchildren of the Rikers (Rycken) family that gave its name to the island that it once owned, at the September 1998 Samuel Perry Center dedication ceremonies during a visit to their ancestral farmland. Click the above image for more on 1998 Samuel Perry Center ceremonies. Although there have been burials in the cemetery between 1919 and 1932 and also since 1932, they are very few and notice of them is not included in the chapter dealing with the cemetery. The Meigs listing provided the identifications of many of the persons buried, and it is the basis of an expanded listing with additional identifications and with relationships with other persons in the cemetery as well as in the genealogy. . . . In addition to the above-cited major sources, others include my own family papers relating to Riker’s Island, documents copied from the law practice records of John L. Riker in the archives of the Greater Ridgewood Historical Society, family data and other help from many Riker cousins of various degrees including principally Dorothy A. Braun, and encouragement from my sister, Dr. Elizabeth N Barnes, and from Thomas McCarthy, Historian of the New York City Correctional Department. My thanks are hereby extended, and my indebtedness is hereby acknowledged, to all who have been of assistance, whether named herein or not, The inevitable errors and omissions, typographical or factual, however, are entirely mine and for them I apologize. 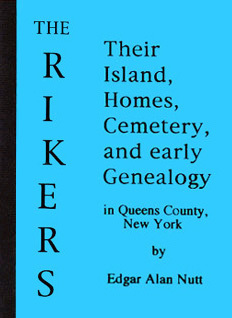 While this work does not represent an attempt to include a comprehensive Riker history and genealogy, it is hoped that it will clarify the available data and information pertaining to the early generations and will increase descendants’ appreciation of our Riker ancestors in the area of the family’s early settlement and growth in what is now the area of New York City. Previous Navigate using directionals (Next or Previous). NYCHS presents excerpts from The Rikers: Their Island, Homes, Cemetery and Early Genealogy in Queens County, NY by permission of its author, an 11th generation Abraham Rijcken vanLent descendant, Edgar Alan Nutt, who retains & reserves all text copyrights. Rikers Island's role in NY correction history warrants our providing material on its "pre-Correction" background that is so bound up with Rikers family history. Bishop Nutt's book serves as an excellent vehicle for doing that. His approach is not exclusively or narrowly genealogical. More than simply tracing lineage, he places his family history in wider chronological and geographic contexts through which his exhaustive research tracked it, thus reflecting much other history -- of the island, county, city and country. Strictly genealogical citations, notes, and codes in the printed book have been reduced or dropped in these excerpts. This presentation includes a book print copy information page. NYCHS retains and reserves all rights to images of photos it took during the June 5, 2005 homestead tour and the September 1998 Samuel Perry Center dedication and their captions as well as captions of inserted images not taken from the printed book.